Leaked documents obtained by PNGi indicate that the National Museum and Art Gallery – the statutory custodian for priceless cultural artefacts – is in an ongoing state of disarray. It can be revealed that there has been a failure to appoint a permanent Director for over a year. This parlous state of affairs has been facilitated through numerous illegal directives that have violated the Regulatory Statutory Authorities (Appointment to Certain Offices) Act 2004. In addition, internal government documentation accuse the Museum’s Board of Trustees of ignoring direct instructions from the Minister to organise a permanent replacement. It seems to me the Senior Officers of the Department appear to be performing their duties to ensure the K10 million was released to Travel Air. They did so with respect to please their “political master,” with the hope to gaining in turn favour from him in that Ms Zarriga was an Acting Secretary while Mr Takale Tuna as Acting Deputy Secretary (PIP) … The minute by Mr Sent appears to be the appraisal which was directed by Ms Zarriga and Mr Tuna. The appraisal contained lies and was misleading and calculated to legitimize the appraisal process. Ms Zarriga and Mr Tuna may have hoped in return to get substantive appointments. Against this backdrop, the situation at the National Museum and Art Gallery is an extremely serious one. Lets look at the evidence. 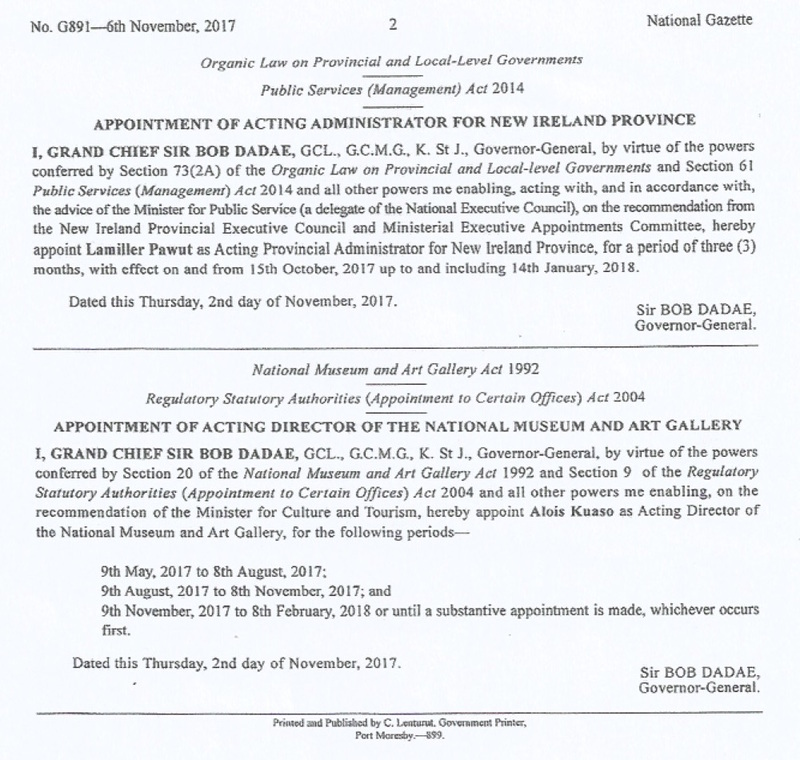 The senior appointments process for the National Museum and Art Gallery is governed in part by the Regulatory Statutory Authorities (Appointment to Certain Offices) Act 2004. It assumes that ordinarily the outgoing Director of the National Museum and Art Gallery will leave in a coordinated manner, allowing a transparent and competitive appointment process to occur. This would ensure that their replacement is secured in advance through a merit based system. However, in exceptional circumstances, an Acting head can be appointed as a stopgap while the process for making a permanent appointment is executed. Image: Section 9, Regulatory Statutory Authorities (Appointment to Certain Offices) Act 2004. 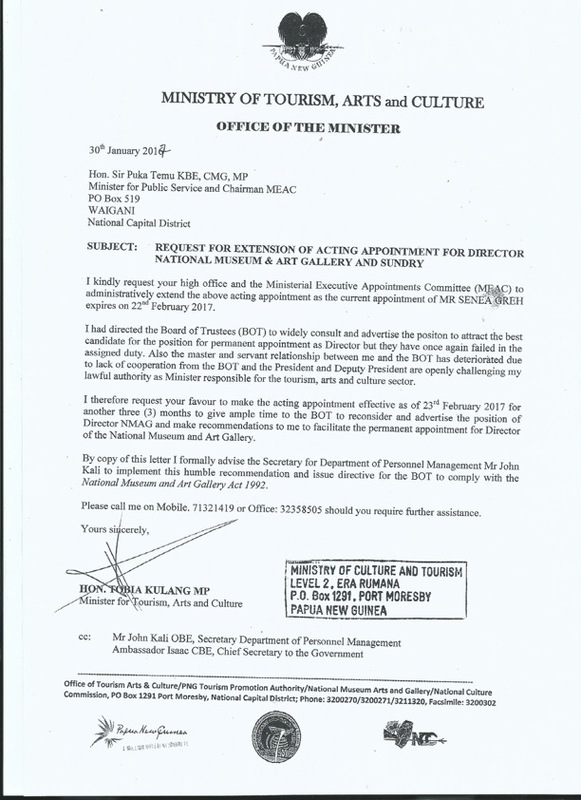 PNGi has obtained a copy of the National Gazette notice appointing the museum’s current Acting Director, Alois Kuaso. In an abuse of process, the Governor General it appears has allowed the National Museum’s Director to be appointed on an Acting basis for a period of nine months. As the legislation explicitly states, ‘Acting’ status is a temporary measure that should not exceed three months. This was deemed by the legislature adequate time for a permanent appointment to be made through a transparent, publicly advertised, merit based process. By rolling over each three month period into the next, the legal requirement for a merit based appointment has in effect been circumvented. However, the question is, who is responsible for this breakdown in the museum’s management? Before Acting Director, Alois Kuaso, was appointed in May 2017, his predecessor was also serving in an Acting status. In an explosive letter written by the then Minister, it is alleged that the National Museum and Art Gallery’s Board of Trustees, have stood in the way of a permanent appointment. This alleged insubordination, the letter claims, is causing the government to renew acting appointments, in violation of the Regulatory Statutory Authorities (Appointment to Certain Offices) Act 2004. The Minister’s allegations raise serious questions over the integrity of the Board, and its managerial processes, that need to be investigated, especially in light of the authority’s chequered history. The above disarray has to be read against the museum’s managerial past, marked as it is by serial corruption and neglect. The National Museum and Art Gallery provides an excellent illustration of this collapse of lawful systems of administration. That Institution did not produce Financial Statements for six years and thereby avoided Audit for the same period – during which it engaged in large scale illegal “sale” or removal of State property in the form of War Surplus, by foreign interests. The Museum, despite my recommendations, had not maintained a proper accounting system for a systematic preparation of financial statements. Consequently, the financial statements, trial balance and the cash book presented for my review could not be relied upon. The Museum did not maintain necessary accounting records and documents such as receipt books, Assets Register and expenditure records which should form the basis of the preparation of the financial statements. The Museum did not properly maintain and update its Fixed Assets Register with the details of identification or serial/code numbers to enable me to locate and verify the existence of the assets. I was advised that no proper stock take or physical count of assets was conducted during the year under review. As a result, I was unable to determine the condition and existence of various assets. In addition, I was not provided with revaluation certificates of buildings and title deeds of land owned by the museum; therefore, I was unable to determine the ownership and valuation of these assets. Human resource management, salaries, and finance, was found to be in a similar state of disrepair. The Auditor General observes: “During my review, I was unable to place any reliance on the total wages of K469,850 disclosed in the financial statements as the amount lacked any form of audit trail to properly trace the aggregate sum to supporting schedules to confirm the break-up of the figures”. When looking at staff travel, the Auditor General notes: “During my examination, I noted that the payments relating to Travel and Subsistence totaling K322,837 were paid to staff during the year. This amount was not acquitted by officers of the Museum after travel which was contrary to the requirements stipulated in the Financial Management Manual”. I noted that the Museum had awarded the contract worth K1,356,500 to a firm without following the Public Tendering process as stipulated in Section 40 of the Public Finances (Management) Act. The above contract was awarded based on Selective Tender process. … I brought this issue to the management’s attention and they did not respond to this query. The new ampitheatre has been named after one of the Trustees currently sitting on the Museum’s Board, Nora Vagi Brash. Against the above backdrop, the failure to appoint a permanent Director after over a year, appears to be yet another symptom of managerial discord. An investigation into failings that have seen the head of the National Museum and Art Gallery appointed on an acting basis for over a year in violation of the law. A thorough criminal investigation into the assets and finances of the National Museum and Art Gallery, with the prosecution of any official or outside actor involved in misappropriation. An inquiry into the award of a K1.3 million contract, in breach of the Public Finances Management Act.